One of my favourite things about Colombia is the wildlife and some of my most amazing nature memories were made in a town called Minca. 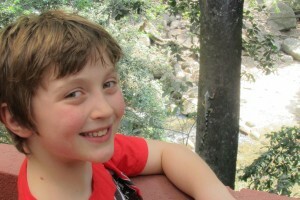 Last weekend we went back to Minca so we could see our good friend Niall and meet his girlfriend, RyAnn, and also to see the wildlife. Because last time was so awesome I thought that we might not manage to see as much new nature, but I shouldn’t have worried. Brown basilisk just after it ran on water! 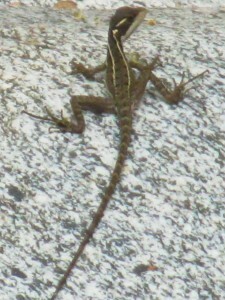 While we were in Minca we saw a lizard when we were out swimming one day, basking on a rock by the edge of the water. We must have startled it because suddenly it shot away from us into the water right next to a waterfall and Brae and I thought it was going to drown! But amazingly it didn’t because it actually ran along the surface of the water like lightning and scampered out the other side!!!!! If I hadn’t seen it with my own eyes I wouldn’t have believed it. When we got home we searched online and found out that it was a brown basilisk, which is sometimes known as a Jesus Lizard. I have read about these lizards but I never thought I’d actually see one doing it. It was insane. 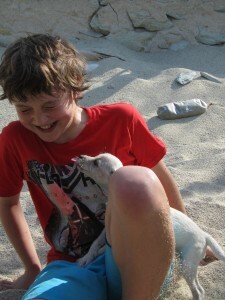 The other new wildlife experience that I will never forget (but not in a good way!) 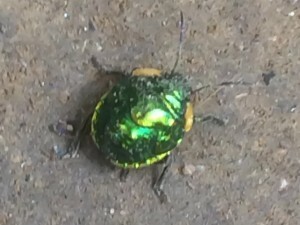 was the sound of a very annoying bug in the jungle in Minca. On Saturday, we tried to go out for a peaceful evening walk to see the sunset but it turned out to be torture! It was all thanks to a bug that a Kogui tribesman told us was called a ‘chicharra’. We were walking down a path and we were deafened by a horrible buzzy drone, which seemed to be coming from the trees around us. It was so loud that it seemed like someone was drilling the road and we had to cover our ears! 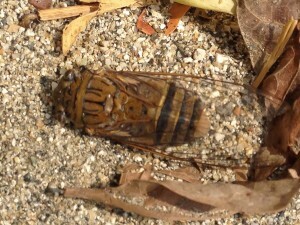 These nasty cicadas were all over the mountainside and the noise got carried on the wind so you could hear it wherever you went. If you don’t believe how loud it was play this video on full volume and it still won’t be as loud as it was in real life. When we got home to our apartment the next day, a chicharra flew right into our lounge through the door to our balcony. It flew around the room bashing into the walls and making a big racket. 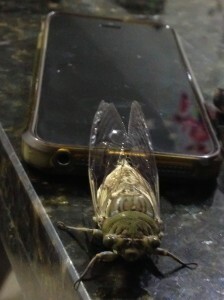 This one was green and you can see how big it is by comparing it to my dad’s phone. 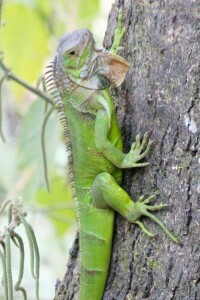 In my previous post about animals, I mentioned that the last time we went to Minca we saw a massive Iguana. We were hoping to see it again but this time we saw a different one! We were making a video to send to Emerald class and as we were filming Brae spotted a baby Iguana. We had to stop the video so we could get a good look and some proper photos of it (sorry Emerald class!). It was a baby one and it was bright green and we had never seen a baby before. Everything is so awesome in Colombia and I am so lucky to have seen so many incredible things, but I still have one dream – to see a monkey in the wild. 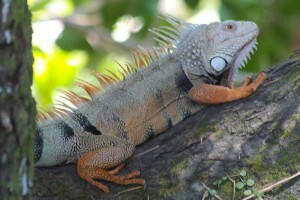 Next weekend I really hope to see one when we go to the national park “Parque Tyrona”, so wish me luck! 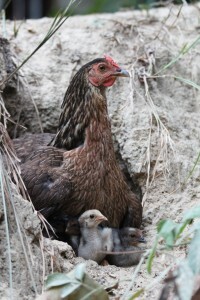 You can find the previous Colombian animals post here. 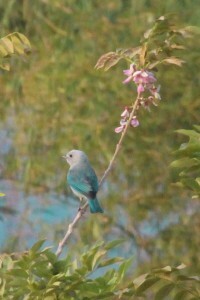 This weekend we went to Minca again and we saw even more amazing birds than the last visit. Last time we were walking for hours but we only saw a toucan from far far away. So we went back to Minca and this time we did see a toucan and it was the best view of a toucan ever!!! It landed on a tree really near us and did not fly away for ages so we could get really good photos of it and focus on it with our binoculars! The toucan was so many different colours and it was amazing. To see a toucan was a thing that we had been wanting to do for ages so when we saw it we were so so happy! It was like a wish come true. 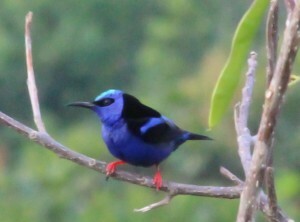 We also saw three different fabulous blue birds. 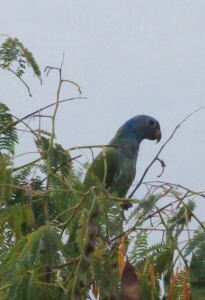 One pale blue, one really dark blue and a blue headed parrot (but we could only see its head because it was in a tree). One thing I can tell you is if you want to see birds, go to Minca! 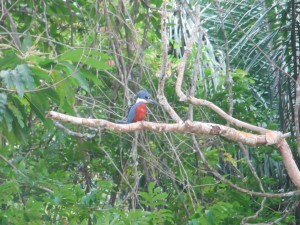 As well as seeing amazing tropical birds we also saw some birds that you will probably recognise! 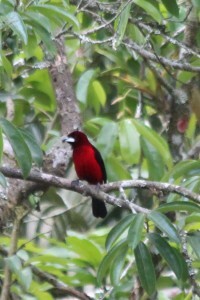 The first Colombian birds post can be found here. In our last few posts we told you about statistics and school, but now we want to remind you how many really, really fun things we’re doing in Colombia…in case you forgot! 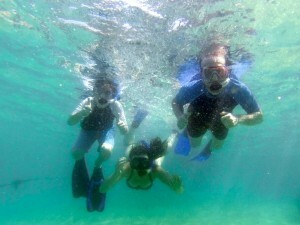 Our friend Maryline, who is my mum and dad’s Spanish teacher, helped us go on an incredible diving lesson on Sunday. Her boyfriend Camilo, and his cousin José are both diving teachers. And because we are friends with Maryline, we had an extra special experience! 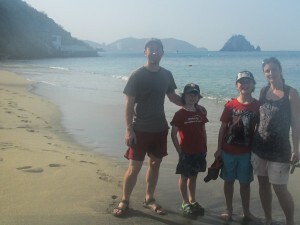 We went to a beach called Playa Blanca (white beach) and the only way to get there is by boat. 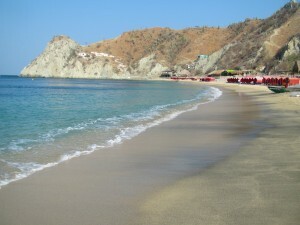 When we arrived, no one was there and so we had the whole beach to ourselves, apart from a little dog and its owner, who has a restaurant on the beach. First we climbed up a hill so we could see the view. 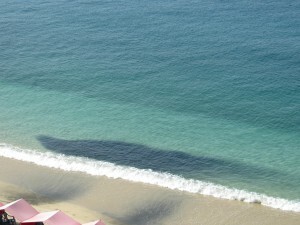 From the top we could see black smudges in the water. 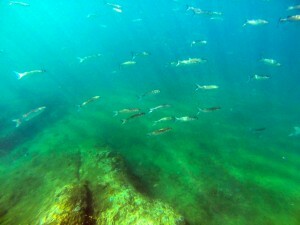 José told us that they were schools of sardines. 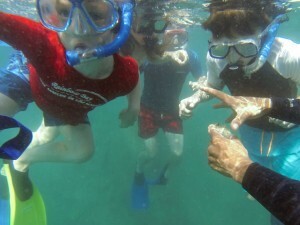 For our lesson, José took us into the water and gave us our masks and snorkels and told us important things you need to know if you want to go free diving. 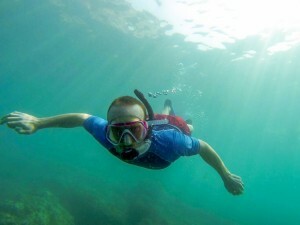 Free diving is when you can dive right down underwater with your snorkel, not just staying on the top. We practiced all the tips he gave us and he said we were doing really well so we set off to the other side of the beach, got our flippers and he told us how to use them. 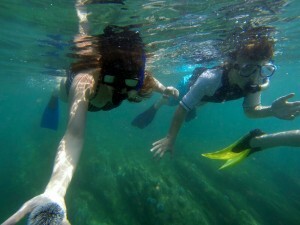 We went diving near a rocky cliff and there was amazing coral and all kinds of incredible fish and sea anemones. We were amazed about all the different colours of the fish. It felt like being in an aquarium. 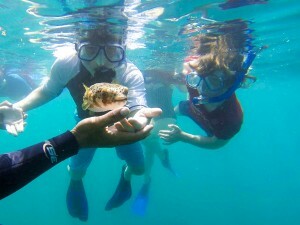 About half way along the cove José spotted a puffer fish swimming around among the coral. 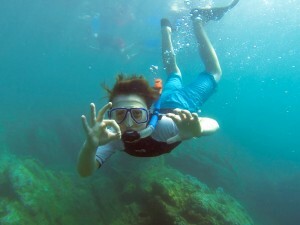 He dived down and gently urged it up towards the surface by putting his hand near its nose but not actually touching it. We were lucky enough to touch it, extremely gently, and it felt like silk because it wasn’t frightened or puffed up. When they’re puffed up they have spikes that point out so they’re like a balloon with spikes on. We would have liked to see it puff up but we didn’t want to make it frightened. While we were diving we didn’t touch the coral as we didn’t want to damage it and also José told us that the orange parts of the coral would really sting if you even put one finger on it. We feel really lucky to have this great experience and to have friends like Maryline, Camilo and José to help us do something so extraordinary that we will never forget. 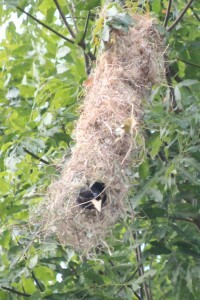 When we went to Minca we saw lots of birds, as we mentioned in our last post. But we didn’t explain it very well so I am going to explain it to you now. 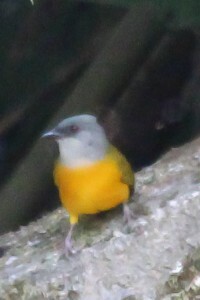 Minca is famous for its amazing birds of all different kinds. 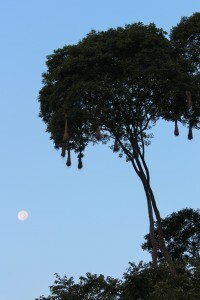 Even though Minca is only a very small town, you can see 162 different species of bird just in this small place! 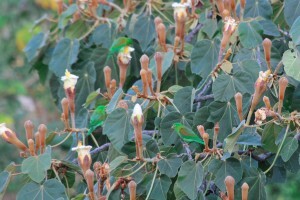 And when you explore the mountains around Minca, you can find 320 species of bird! Altogether, there are almost 2000 species of birds in Colombia – more than any other country in the world. 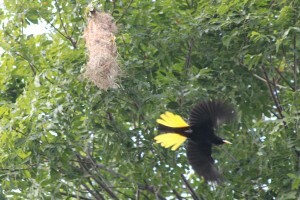 So now you know what I mean when I say we saw lots of birds in Minca! 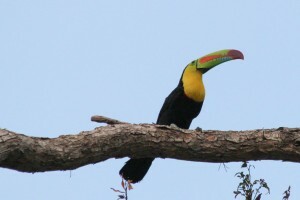 To see toucans and parrots and other fascinating birds, you need to get up at 5 o’clock in the morning or even earlier. We got up early to go bird watching two mornings in a row. The toucan is a bird that everyone wants to see and we were lucky enough to see one, but if a toucan hears or sees you they fly away so that’s why we couldn’t take a picture of one in the real wild. 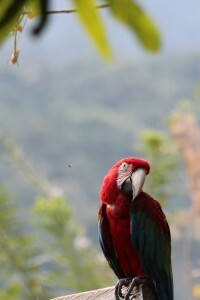 I did get some good photos (on my own camera) of some other of my favorites, like wonderful macaws, hummingbirds which flap their wings at an unbelievable speed, and an amazing black and yellow bird called a crested oropendola that makes a nest in the shape of a bag hanging from a tree. The blue headed parrot is a incredible bird of all different colors. But it is given its name by its amazing blue head. The males don’t even have blue heads. 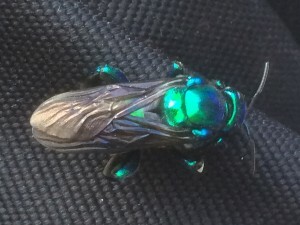 The reason it is given its name is because of the females amazing blue stipe down the center of its head. 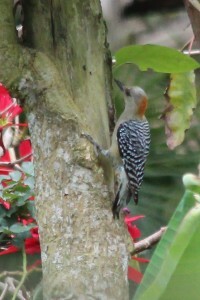 We also saw woodpeckers and parakeets and lots of other birds that you won’t have heard of. My favourite group of animals is primates but my second is definitely reptiles, and in Minca I saw the most amazing reptile I have ever seen! 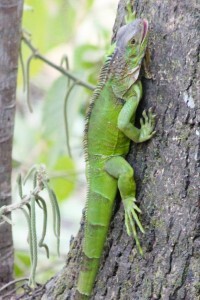 It was a three-foot long green iguana (that is its species’ name but they have different colors as well) climbing slowly up the tree outside our window in Minca. When I spotted it I thought it was a dream at first but then I got back to my senses and called my family. It was one of the best experiences of my life. In Colombia there is a huge range of animal species ranging from exotic birds to monkeys. Colombia holds the biggest range of butterflies and the second most of birds in the whole world! 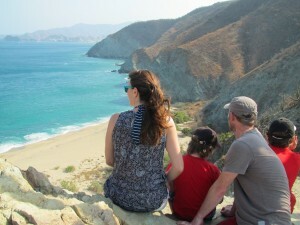 The national park ‘Parque Tayrona’, near where we live, is home to hundreds of species of animals. Today my family and I went on a trek up a mountain and then floated down the river on a tyre. As we peered into the jungle canopy I was amazed to see a huge king fisher sitting on a branch acting still, staring down at us. It was the first one my mum and dad had seen in forty-one years, and I spotted it! In Colombia everyone wakes up really early. 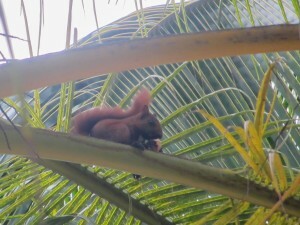 In Palomino (where we stayed this week) at about six in the morning you can see little red squirrels scurrying in the trees. They are adorable! 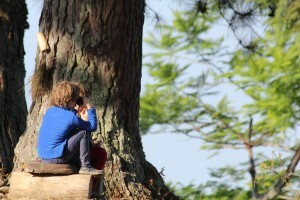 You can also see lots of interesting birds and hear their calls. There is a bird that looks like a black bird with a really long tail, which has an amazing amount of calls – it is squawking at me right now. My dream is to see a monkey in the wild and I might be able to see one in ‘parque Tayrona’. 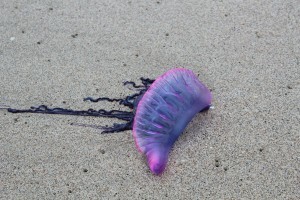 We also saw a Portuguese man-of-war (it looks like a jellyfish but it’s actually something called a siphonophore!). For humans their sting is excruciatingly painful but rarely deadly, even dead ones can sting you. On the way back from Palomino we saw two massive green iguanas basking in the sun but they ran away before we could take a photo. This is a good time to tell you that I’ve always felt passionate about animals, so having this opportunity to see so many new ones is unbelievably awesome!